Ericsson (NASDAQ: ERIC) foresees continued rapid growth of mobile connectivity as global mobile data traffic increases to eight times its current level by 2022. For the next six years, nearly 2.6 billion new subscribers will be added to mobile broadband networks - enough to fill a European championship soccer stadium (with capacity of 50,000) 20 times each day. As many people went to Times Square in New York to welcome in the new year for 2017. The use of smartphones and easy access to mobile internet services comprise a major part of the traffic numbers. Ericsson analyzes "smartphone mobile data traffic" within "mobile data traffic" to illustrate this trend more clearly. By the end of 2022, total smartphone mobile data traffic will have increased 9X, reaching 66 ExaBytes per month. Niklas Heuveldop, Chief Strategy Officer and Head of Technology and Emerging Business, Ericsson, says: "Based on measurements made in hundreds of mobile networks, the Ericsson Mobility Report data truly illustrates the tremendous underlying growth in the industry. 4G subscriptions are increasing faster than ever, Voice over LTE uptake is accelerating and traffic growth has reached levels we have not seen since 2013. "I am particularly excited to see the industry's major steps to progress network evolution, including the approval of the Non-Standalone 5G New Radio (NR) that will enable early 5G deployments. According to our forecast, we anticipate that this will lead to more than half a billion 5G subscriptions and a population coverage of 15 percent by 2022." While LTE uptake is driven by demand for improved user experience and faster networks, 5G deployment will also be driven by the need for enhanced mobile broadband capabilities as well as industry solutions for efficiency and automation. 5G will be the one network to support a diversity of use cases. 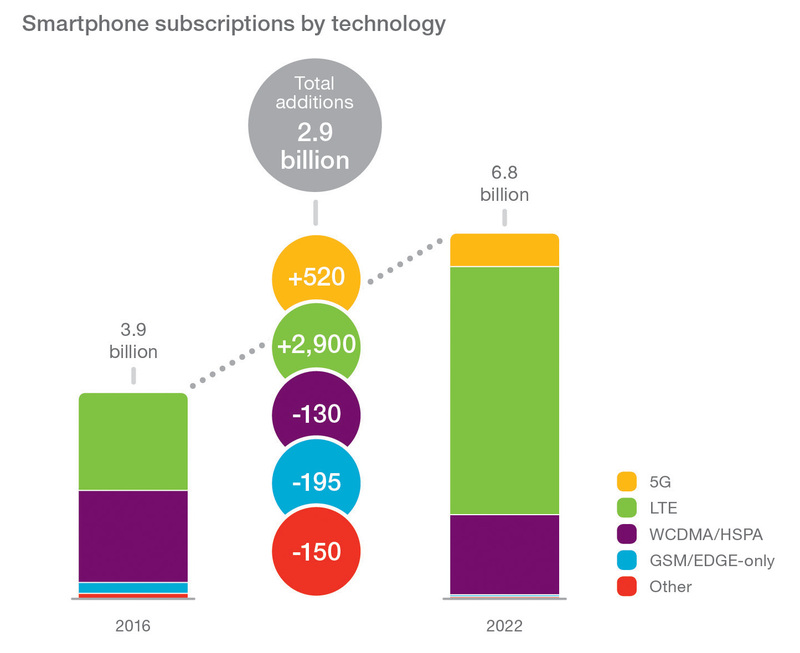 More than half a billion 5G subscriptions are expected to be activated by 2022, not including IoT connections. 5G is then expected to cover around 15 percent of the world's population. Register for our webinar today, June 13, to get into the details. See the full report including the Traffic Exploration Tool to create your own graphs.